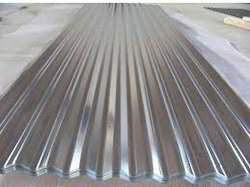 Our product range includes a wide range of galvanized corrugated sheets. We provide our customers with an assortment of corrugated sheets, galvanized corrugated sheets and galvanized plain sheets. These sheets are manufactured using premium quality material which provides high tensile strength and makes them seepage resistant. GC sheets prove to be a cost effective solution for various construction purposes such as roofing, side-walls, partitions and panels.